KJIPUKTUK (Halifax) – Last summer Shirley Peck, a cleaner at CFB Greenwood, a military base in rural Nova Scotia, was told that she was to be laid off, and that her well paying job would be contracted out. She was devastated. The contractor offered Peck and her colleagues, all women, a job paying about $11 an hour, only half the money they made as employees of the Department of National Defence (DND). The remainder of the 25 unionized workers who clean at the base, the ones with indeterminate (permanent) positions, were set to be be replaced with contracted workers after they retired or left their positions. It’s true. All too often it’s a foregone conclusion when government decides to outsource a service. Workers lose good jobs, service quality takes a hit, and the contractor is laughing all the way to the bank. Not this time though. The Public Service Alliance of Canada, and its component Union of National Defence Employees (UNDE) fought back, and won. Meanwhile in Ontario a similar battle was brewing. 70 cleaning positions stood to be eliminated at CFB Kingston through attrition. There too a contractor was set to take over. In Nova Scotia the fight was quick and intense. 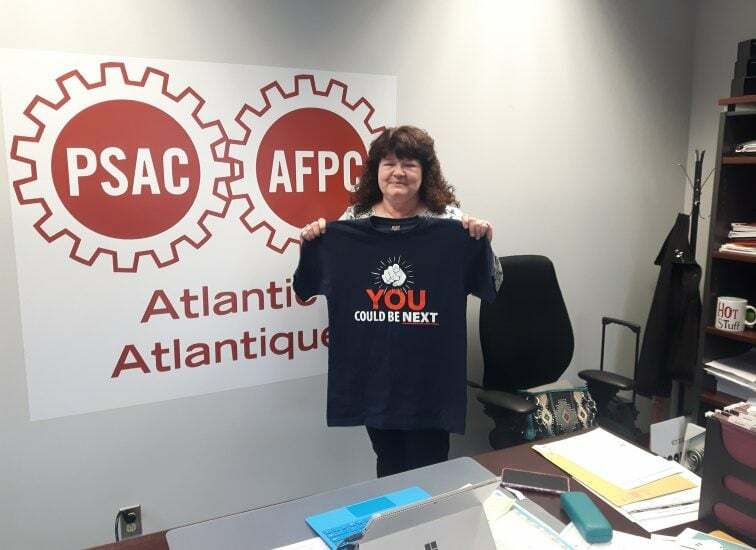 “What made this successful is that we hit them hard, and we hit them where it hurts, we hit them in the public eye,” says Colleen Coffey, Atlantic Regional Executive Vice President of PSAC, who was closely involved in the campaign. An electronic letter writing campaign early on had some 1500 participants, not bad for a community of 5,400. Each time a letter was sent five more copies reached the inboxes of Nova Scotia Liberal MPs. That was just the beginning. A large rally at the base was next, some ninety workers, half the union local membership, turned out at 6 AM in the morning, just when everybody was trying to get to work. Lineups stretched for five kilometres, Coffey says. “We have 1500 signed cards, multiply that by four times that number for each household, and that is how many less votes you will get next time,” the cleaners told an assistant. While they were heading for their cars the assistant came running after them, and said, just a minute, Mr. Fraser wants to talk to you. “When I heard that I got a feeling we could win,” says Coffey. Meanwhile, as mentioned before, a similar battle was being fought in Kingston. The Nova Scotia folks were well aware of this, says Peck. “We thought of the two bases as fighting side by side. We were very aware of that, mostly through Coleen (Coffey). I felt bad for them too, it is not just about you, it was one for all and all for one,” says Peck. Kingston is much larger, but here the union had information about the cost (in)efficiency of contracting out, and it used that to the advantage of workers at both bases. “We had evidence that contracting out wouldn’t save money, that public service workers provided better service, and that it was the preferred option from the base command’s perspective. We learned that contracting out was simply a budget line move, it might well cost more,” says Girash. That knowledge became the theme of a powerful advertising campaign that ran in Nova Scotia, and also in Ottawa. 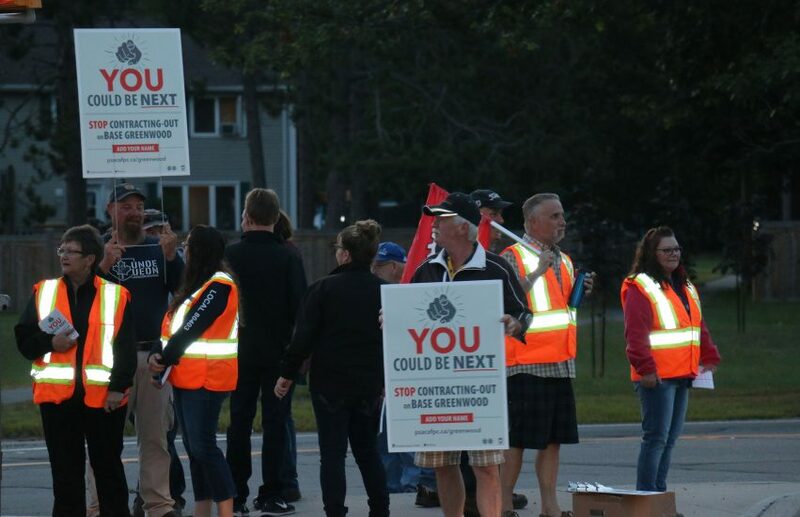 On September 26 the department announced that contracting cleaning services was off the table for Kingston and Greenwood, and that the 7 Nova Scotia workers were to be made permanent. DND even hired five additional cleaners, to accommodate an expansion on the base. “The day that we were told that we had won, and that we were getting permanent jobs, it was such a feeling of peace,” says Peck. “What really bothered me was how if Greenwood could get rid of qualified cleaners and contract out the same job for a lot less money and no benefits, I mean, who will come next? Will it be the plumbers, the electricians? All of sudden we become a base full of contractors, and no more DND employees,” Peck says.